Nature study: Aisling guides Brendan through the woods. The Book of Kells is a treasure of the Christian faith: Crafted by monks in the Middle Ages, its glorious illuminations are so finely wrought that it takes a magnifying glass to fully appreciate them. 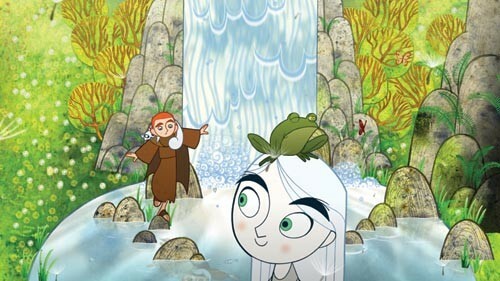 No surprise, then, that almost every frame of The Secret of Kells is lushly illustrated, suffused with detail that begs further inspection. Even the snowflakes are tiny Celtic crosses. Kells is loosely based on history: In the eighth and ninth centuries, Irish abbeys had been centers of learning while mainland Europe lay shrouded in the Dark Ages. But Viking raids threatened the abbeys, too. One of the last to fall was Kells -- presented in this animated 75-minute film as a fortress ruled by the stern Abbot Cellach. The abbot's nephew, Brendan, is a 12-year-old orphan forbidden to leave the abbey's looming walls. But Brendan falls under the spell of Brother Aidan, an illuminator who arrives in Kells after fleeing the Vikings. Aidan brings the still-unfinished legendary book with him, and Brendan -- like director Tomm Moore, apparently -- is captivated by its dizzying illustrations. In a quest to find ink and inspiration for its pages, he leaves the abbey to explore the world beyond. There he meets Aisling, a childlike forest spirit who guides him through nature's wonders and dangers, even as the Norsemen draw nigh. The narrative is simple, even simplistic: Brendan must confront his uncle, and an ancient evil spoken of in pagan myth. He must surmount his own nameless fears, bearing the faith before the rising Viking tide. Along the way, Kells suggests a distinctly Irish syncretism, a joining of Christian tradition with pagan nature-worship, all fused with playful wit. And while much of the book's real history is uncertain, that is the spirit in which it must have been created. Meanwhile, the film synthesizes its own disparate traditions. At times -- such as the opening credits or the music accompanying one of Aisling's magical spells -- the mood is haunting, almost otherworldly. Other times it becomes as familiar as a Saturday-morning cartoon. (Parents of small or sensitive children take note: The Vikings, while highly stylized, are the things of a child's nightmare -- both robotic and bestial.) And much as opera-lovers might enjoy a Bugs Bunny short, amateur scholars will be gratified by the winking historical allusions here. Brendan's feline companion, for example, takes its name from a famous poem written by an anonymous Irish monk. Kells was a surprise European contender at this year's Academy Awards, its hand-crafted imagery defying the perfectly machined edges of the Pixar franchise. Hollywood's raiders won that round -- Up took the Oscar for Best Animated Feature. But in the forest's shadows, there remain flashes of a less polished, yet strangely affecting, tradition.